Map It helps you turn training requests into projects that make a real difference. Help the client identify what’s really causing the performance problem. Determine the role (if any!) of training. Create realistic activities that help people practice what they need to do, not just show what they know. Let people pull the information they need to complete the activity — no more information dumps! Enjoy creating challenging activities that people want to complete. Show how your project has improved the performance of the organization. 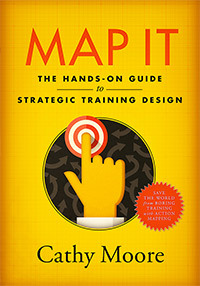 Using humor and lots of examples, Map It walks you through action mapping, a visual approach to needs analysis and training design. Organizations around the world use action mapping to improve performance with targeted, efficient training. Read it on your Kindle, or on your computer or tablet using Amazon’s Kindle app. Zoom in to images and tables. Amazon determines the discounted price. The retail price of the book is $57 US. Amazon will discount this price at their own discretion, which is out of my control. Different sites might show different prices, and these are all subject to change. Australia, Asia: The book is available from Book Depository. I don’t know if it will be available from Amazon’s India, Japan, or China sites and unfortunately have no control over this. Latin America: The paper version of the book might become available through Amazon Brazil or Mexico (currently only the Kindle version is listed). You might also try Book Depository. Everywhere else: If no Amazon site will ship the book to your country, check the countries that Book Depository ships to. The paper book is available through that site at this link.